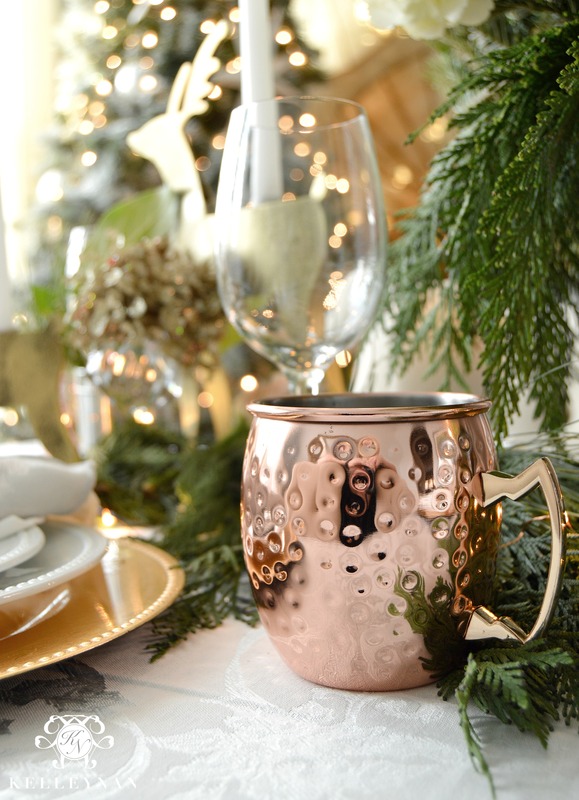 Fewer things have been hotter in 2015 than copper mugs. I personally have never even tasted a Moscow Mule, but I was dying to join the club and add some of that copper goodness to my drink glass collection. 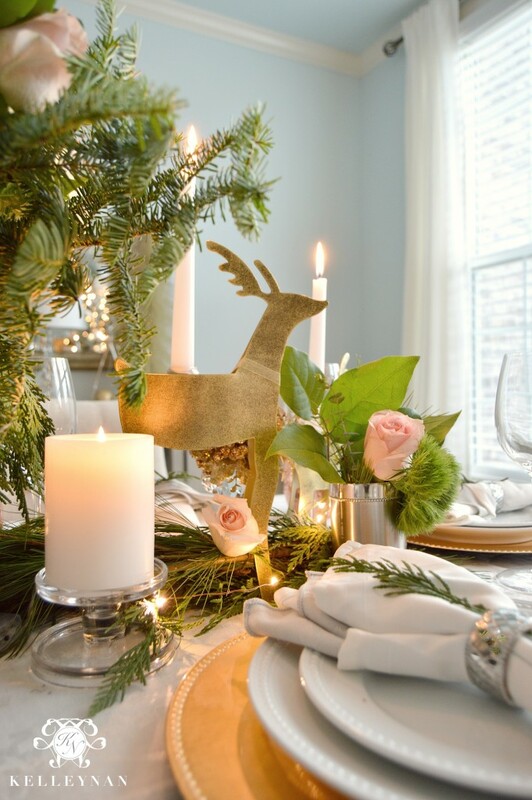 I thought that the warm tones would be gorgeous for a holiday table, but not using traditional red and green in my holiday decor, I took a little bit of an unexpected route. 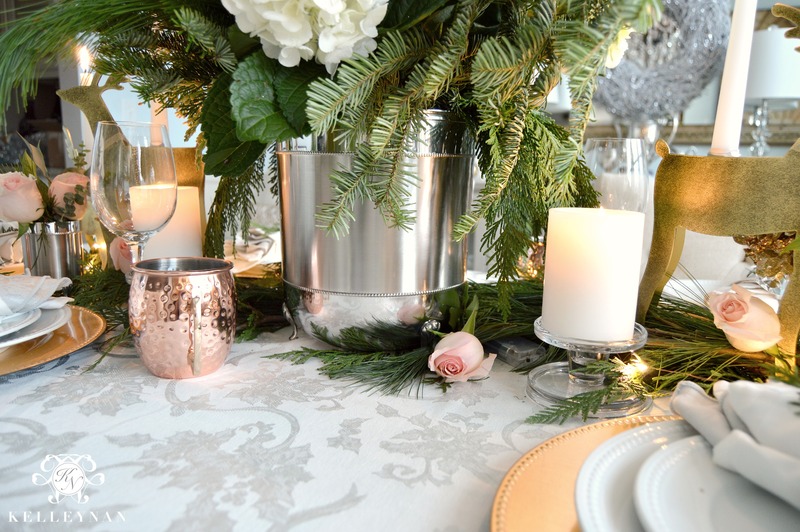 Below, I will go through the details of my holiday table, completely inspired by those unmistakable hammered copper cups. *All table component sources linked throughout blog. In planning my color scheme, silver and gold were a given. 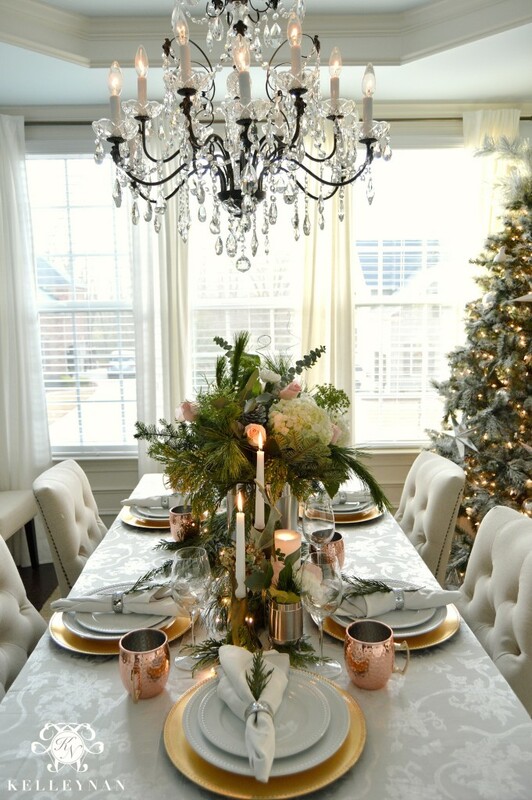 You can see my previous holiday tablescape, made up entirely of metallics in my CHRISTMAS HOME TOUR. 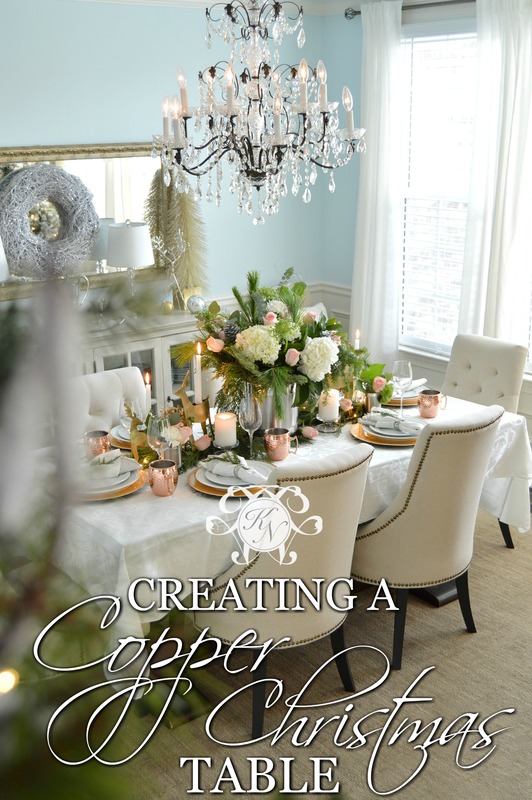 I decided that along with a healthy heap of fresh holiday greens, I would use pale pink to help tie in the copper. Starting with the inspiration for the entire table, I found these Moscow Mule cups at Bed Bath and Beyond. While I preferred the hammered finish, they have a ridiculous amount of options; you can check them out HERE. Although one may not consider the colors “traditional”, I wanted the table to be composed of traditional elements. 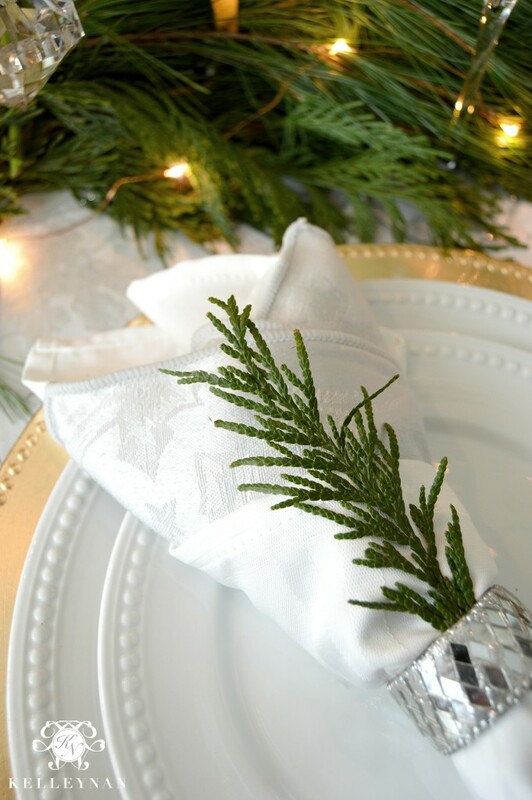 I selected this white tablecloth and spread fresh greenery down the center. 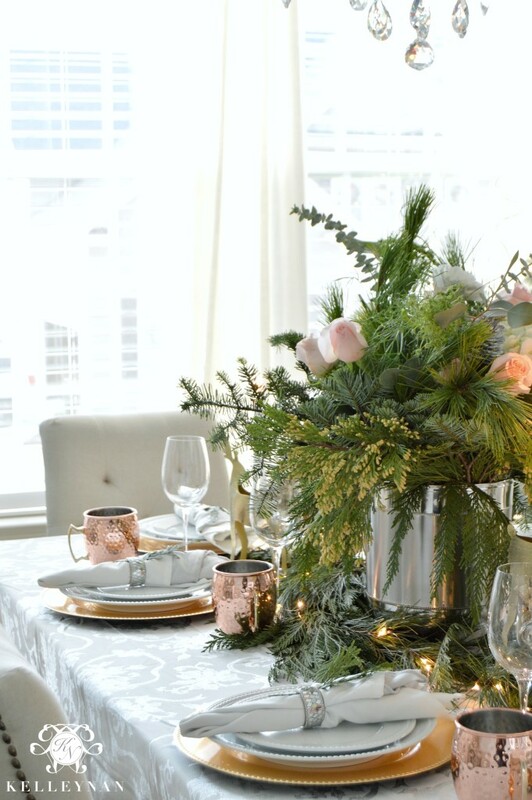 Even though I knew I was going to be using candles, I was planning so much height with the florals, greenery, and tall candles, that I wanted to have light to illuminate the details in the center. I used a thin, dainty copper wire strand which operates off of a couple of AA batteries. I can’t believe how much the tiny lights illuminate! The centerpiece may be my favorite part of the table. I am always looking for ways to repurpose items and while a champagne bucket or large vase could have been expensive (I knew I wanted something that would hold a BIG arrangement), I found this beautiful, stainless steel waste basket (yes, you read correctly) in the bath section of my local Bed Bath & Beyond. It is even detailed with little feet like it was meant for my table! And, I didn’t stop there. 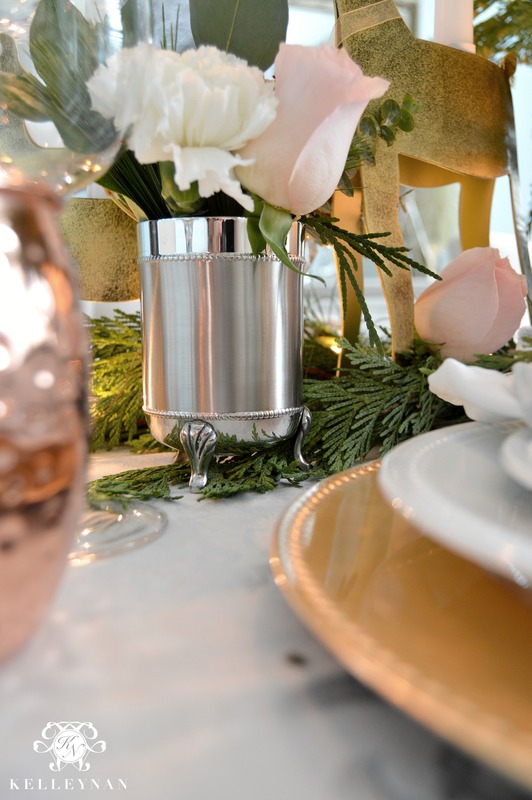 I found coordinating tumblers with the same little feet that I picked up to use as smaller bud vases to carry that light coppery pink down the length of my table. You can find both HERE. After seeing just how much wastebasket centerpieces can hold, I may just have to stock up on them in other colors haha (but no, seriously). 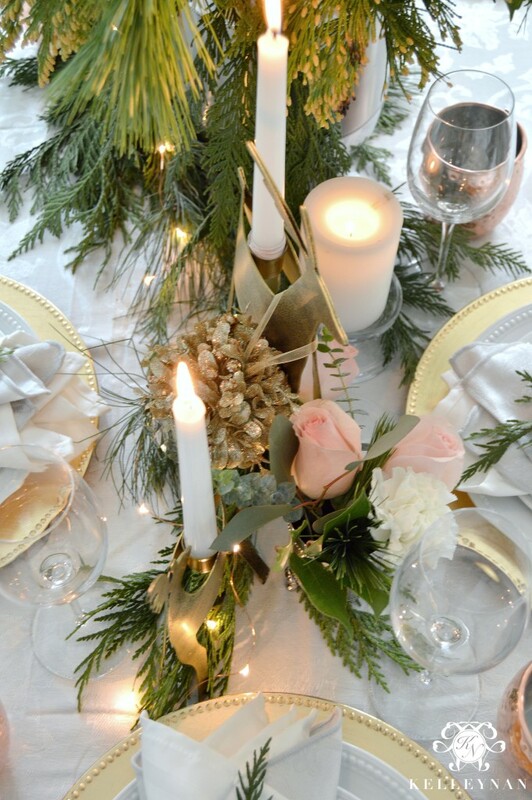 Because I had so much “going on” in the garland, I wanted to keep the individual place settings clean and easy on the eyes. 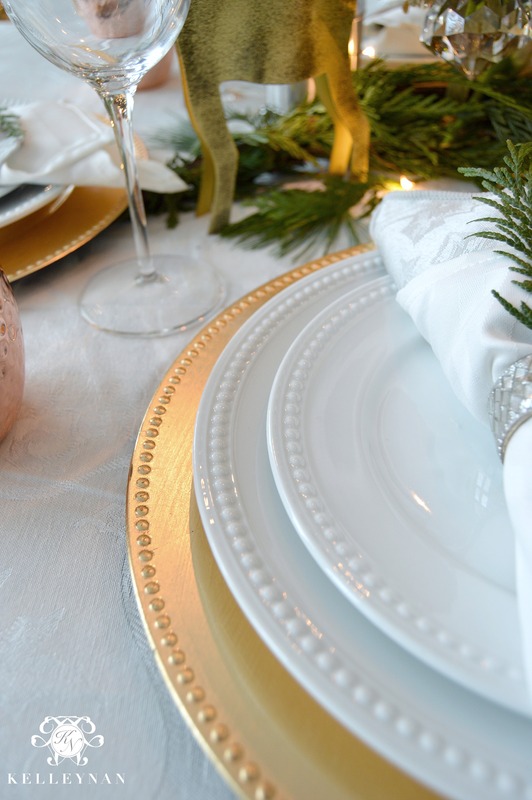 I love using simple white dinnerware because it is so versatile. 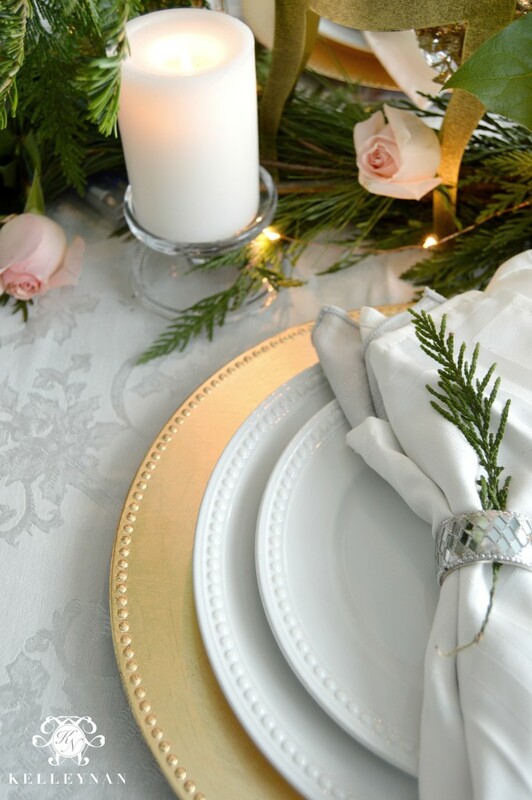 I found these white beaded plates and layered them on top of these inexpensive beaded edge gold chargers to give a little contrast between the white tablecloth. Even though they aren’t from the same collection, I love how the edges are uniform. For me, the easiest way to make napkins “exciting” is to layer them. You don’t even have to use vibrant, contrasting colors to make an impact. 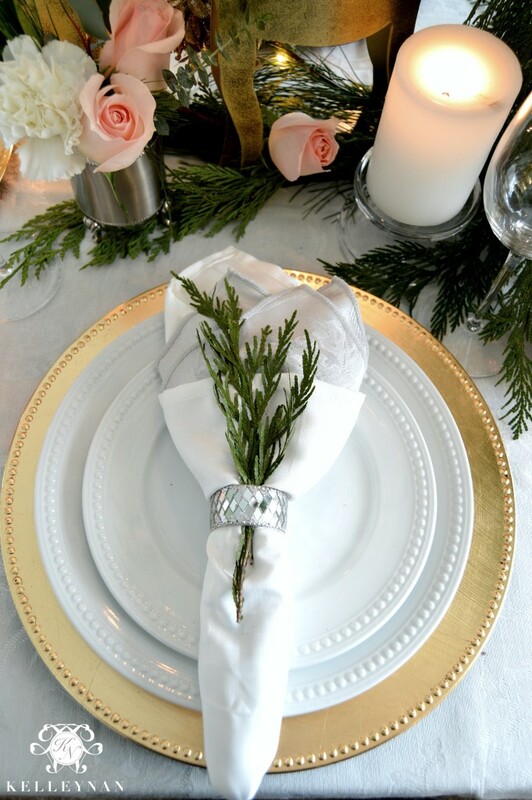 I used these silver napkins (the pattern coordinates with the tablecloth) with these classic white napkins and finished them off with this mirrored napkin ring and a sprig of greenery. If you have followed my posts for any time at all, you probably know that I jump at the chance to add a little “glam” to anything. This is what the place setting looks like, layered all together. If you are in need of some new wine glasses, chardonnay specifically, I highly recommend these Luigi Bormioli Crescendo glasses. They are thin and dainty enough to go on an elegant table, but they won’t break the bank. 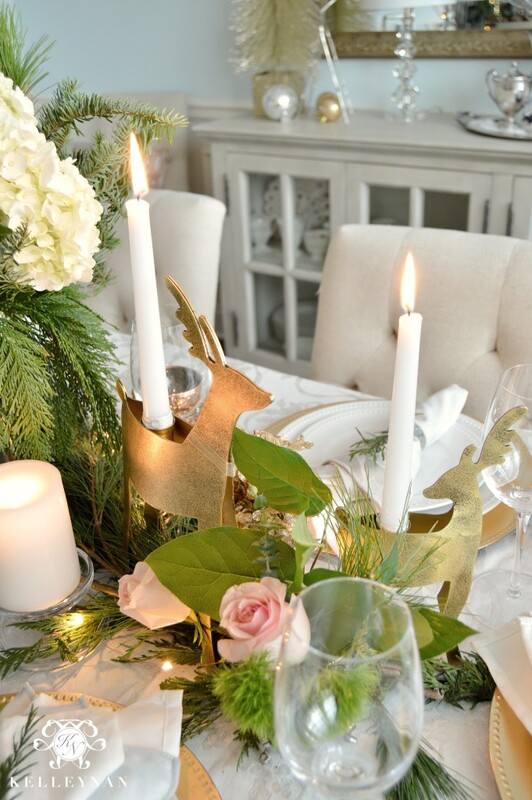 I typically approach seasonal tables with the mindset of using universal, versatile pieces for the main elements and incorporating holiday accents. Not only does it help being able to mix and match and display pieces year-round, but I prefer the aesthetic of a table that isn’t so literal. 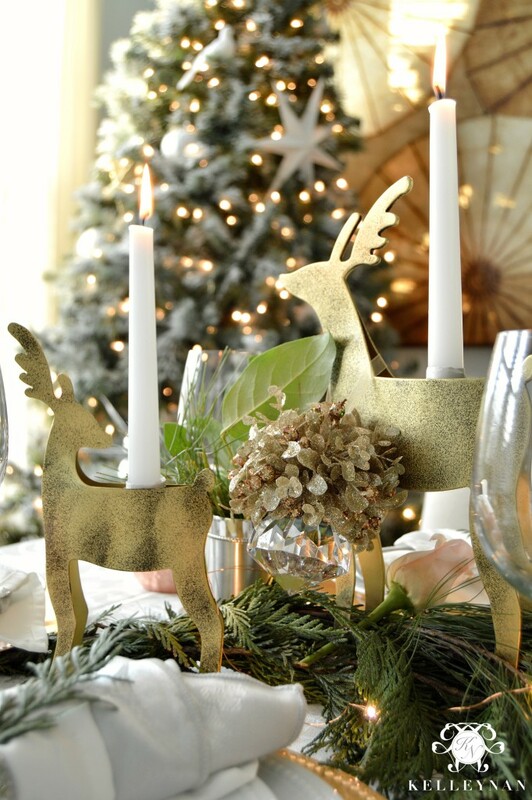 I did fall in love with these little gold reindeer candle holders. I picked up four total, two in each size and used them in the center of the table. I even used this glitzy mistletoe as a necklace for the largest of the deer. With the elegance of tall tapered candles, I like to incorporate some pillars also. So they wouldn’t compete with the deer, I used these simple glass pillar stands. I wanted to create a “meadow” in the garland so I even incorporated a few of the pink rose blooms and tucked them directly into the garland. 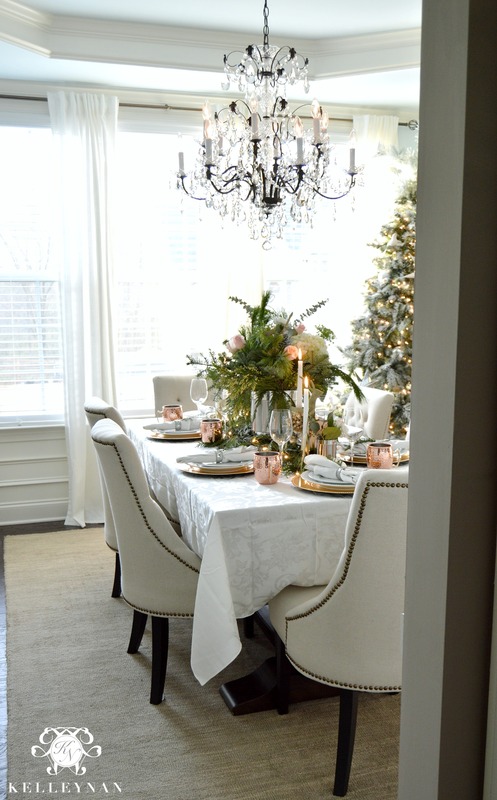 From this angle, you can really see how the table doesn’t look like an out-of-season-pink, but rather a warm, Christmas rose gold. 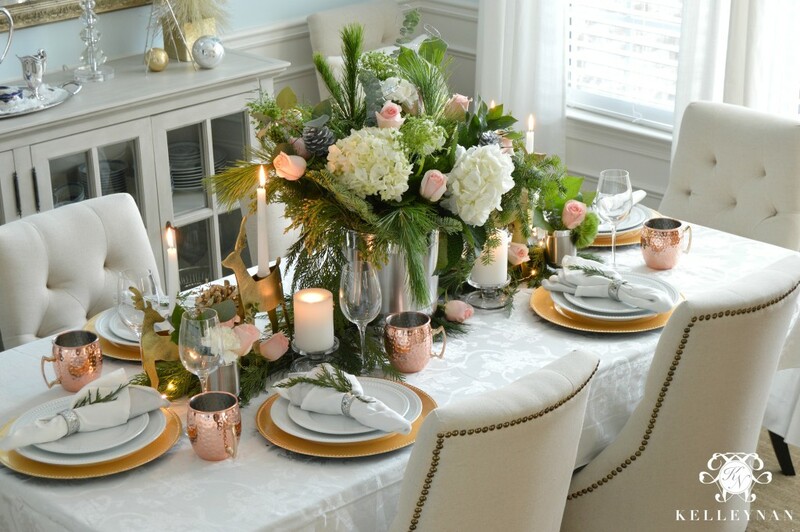 While the center of the table has been built up, the individual place settings have plenty of space for guests. 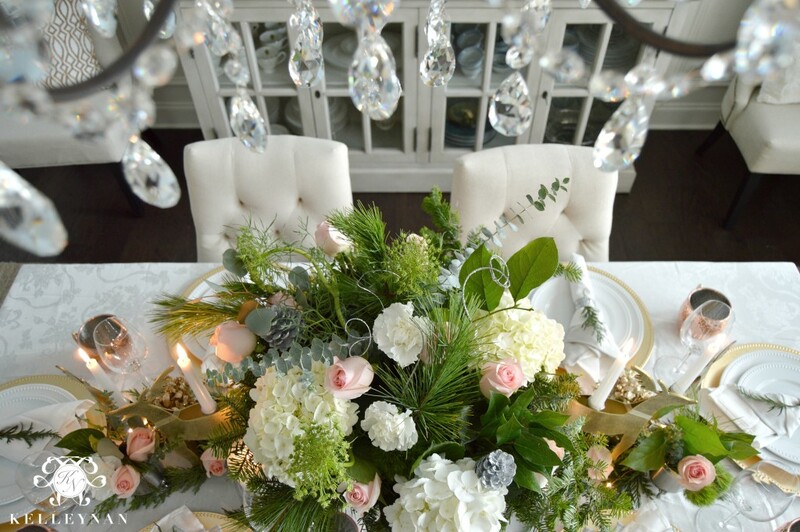 From this view of the floral arrangement, I took the approach as I did with my Christmas tree. Create your base (in this case, I laid the cedar and some pine branches down first), and then start sticking in your other stems. 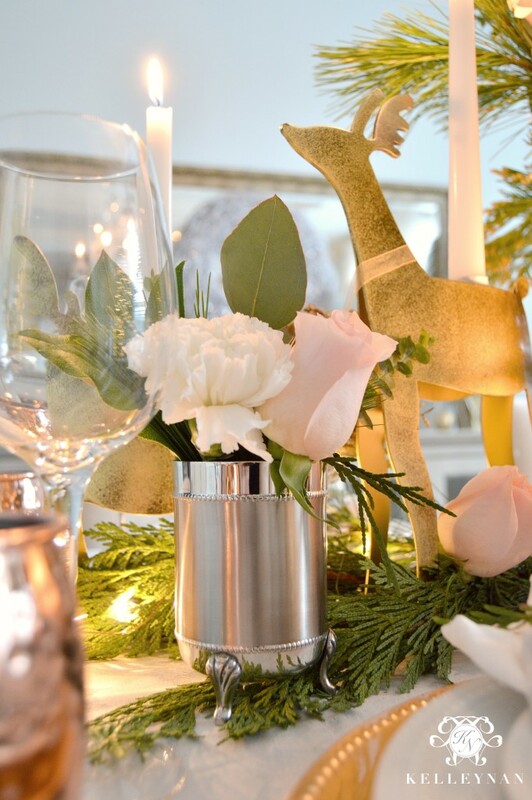 The “bud vases” are miniature versions of the main centerpiece. 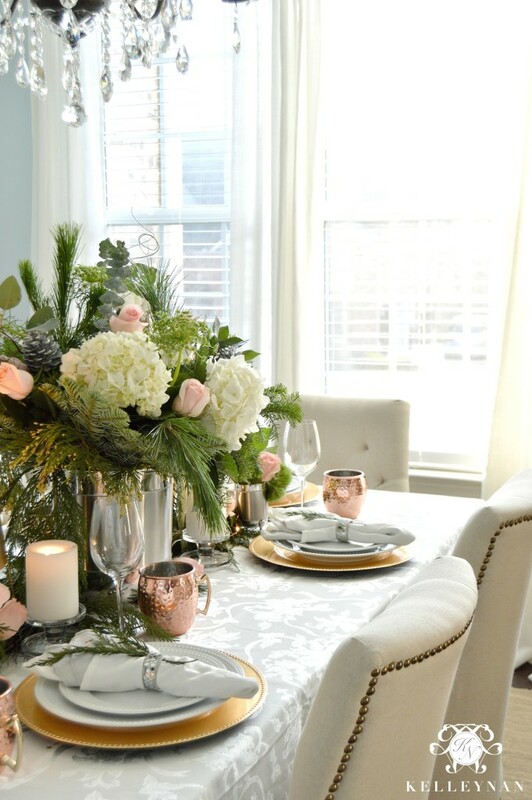 I loved creating this unexpected holiday table and hope it can inspire you to try something a little outside of the box. Instead of just thinking about the sights that remind you of the holidays, try to consider the smells and what makes you feel like it is Christmas. 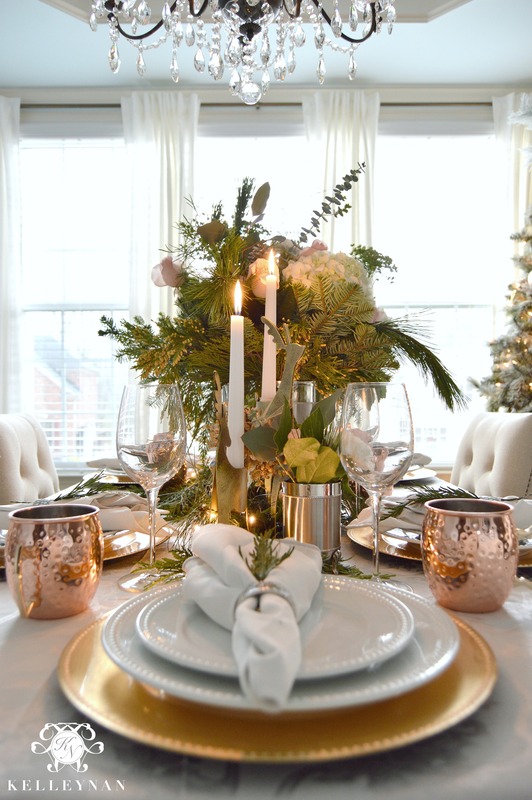 Greenery, warm candle light, fine textures, and the warmth of copper made my dining room feel more like Christmas than if I had laid out plates with paintings of Santa Claus. 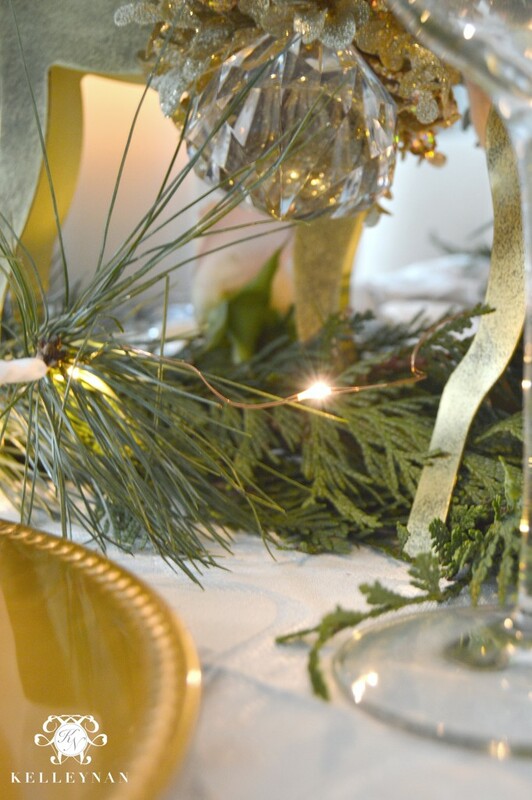 I would love to hear what you think of this non-traditional take on a Christmas table! Note: This is a sponsored post by Bed Bath & Beyond. While I received compensation and/or product for my review, all opinions are my own. Kelly, thank you so much! That means a lot; I love switching everything up! 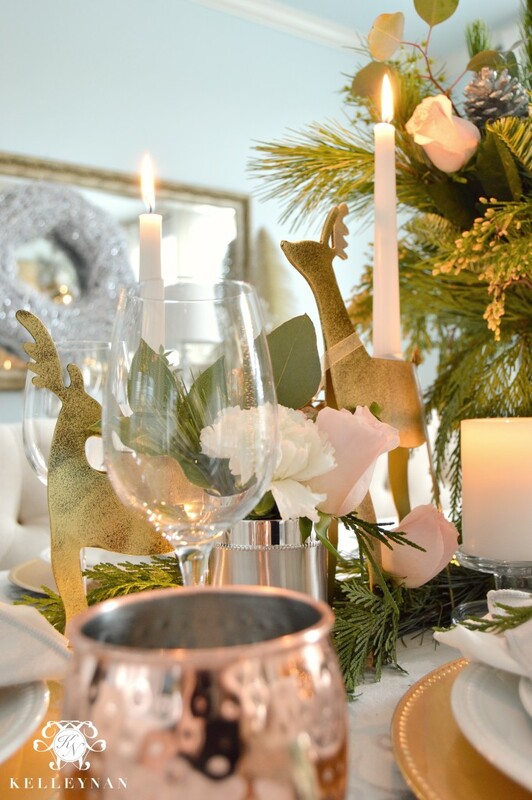 What a beautiful holiday tablescape, Kelley! 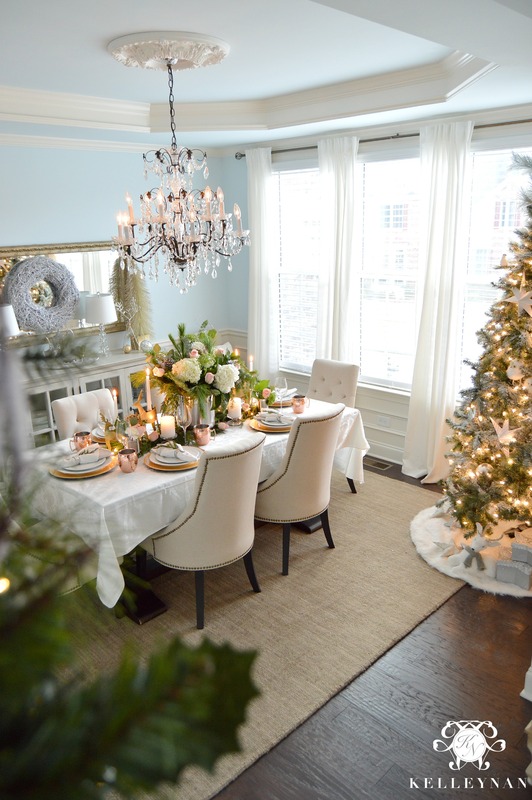 I love all the unexpected touches of the elements you used and how you pulled them all together into one cohesive look! Just gorgeous! Kathleen, thank you! I am not above using a waste basket as the centerpiece haha- but I love it! Bree, that means so much; thank you! You have no idea how much I admire your impeccable style. Merry Christmas, my friend. Totally dying kell!!! I love everything! You did an amazing job! I am in love with the idea of using the trash bin and those little footed cases are perfect! I’m off to pick myself up some!!! So so perfect!!! Randi, you are so wonderful! If it passes the test with your fine style, I am ecstatic. Thank you so much for visiting. Kelley, you’ve totally outdone yourself! 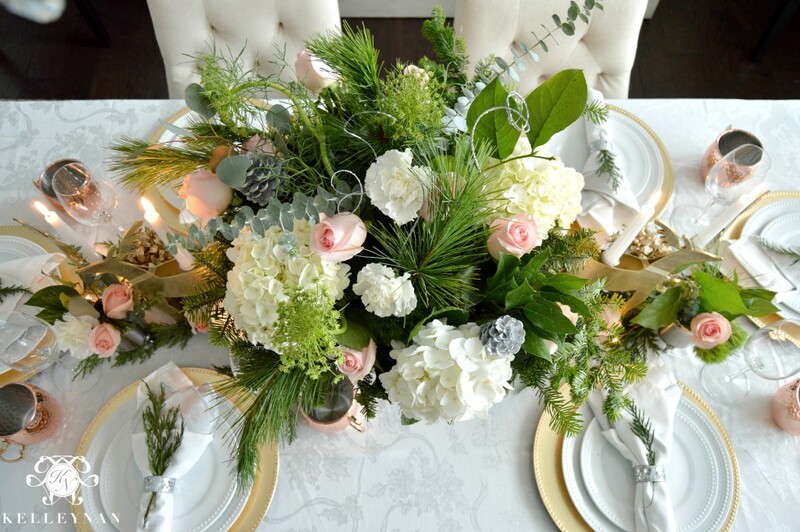 Stunning and such a creative route to take for the centerpiece! Genius! Just so pretty! Kudos, friend! Haneen, thank you so much! It is so fun to see different takes on tables! Rhonda, thank you so much! I am thrilled you came over to the blog to check it out. You are wonderful. Kelley, This is incredible!! you’ve done such a beautiful job as always. Girl! You have impeccable style and your photography is gorgeous!! Those waste bins for centerpieces…PURE GENIUS!! 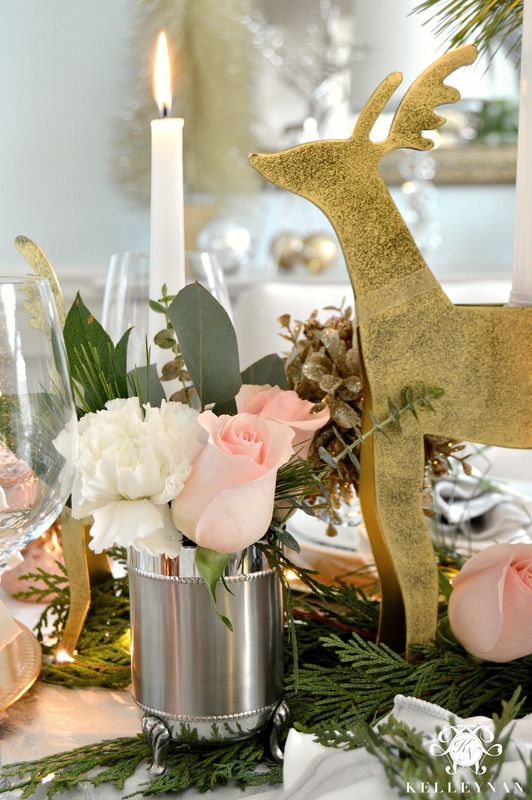 Love the blush roses with your Christmas decor too! 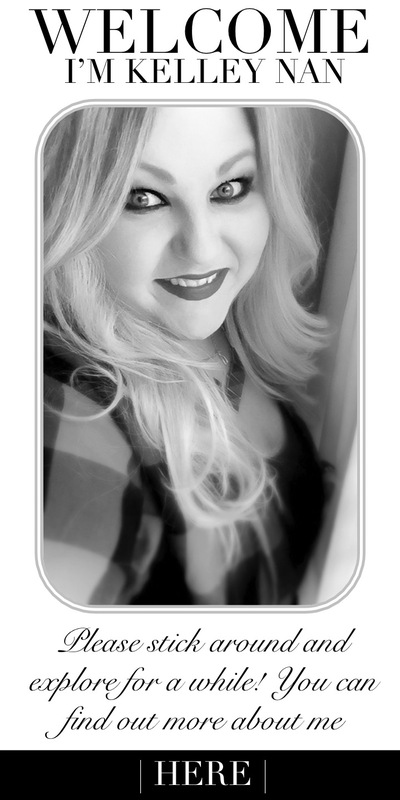 Your’e so crazy talented Kelley! Shauna, THANK YOU!! And I am serious, I think I may have to get some more to start creating arrangements in. Kelly this absolutely magnificent! 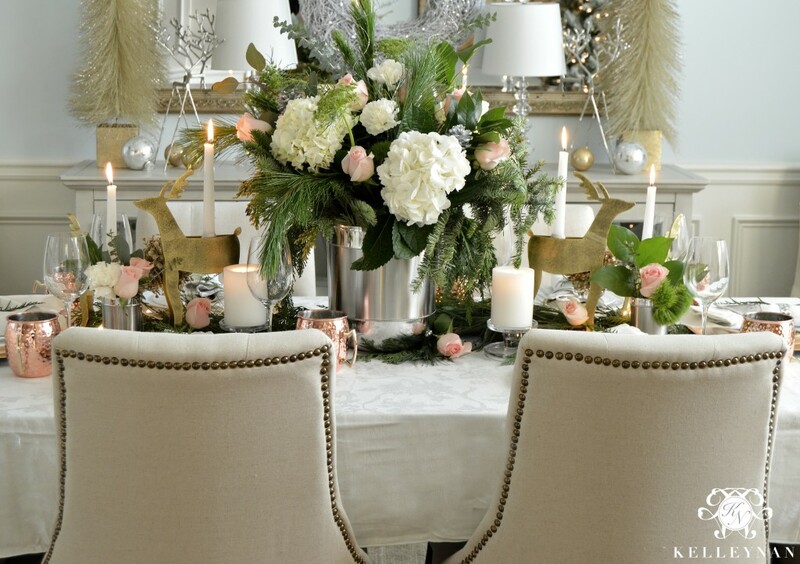 My favorite holiday table this season, this far!!!! I’m so obsessed! Everything is so beautiful! Thank you for sharing your home with us! I love your chandelier ….can I ask where you got it??? MaryAnn, thank you! We purchased it from an Atlanta-based lighting company, Progressive Lighting.